Basketball fans prematurely predicted that the 2003-04 Los Angeles Lakers would prevail as NBA champions. But their opponents in the Finals, the Detroit Pistons, had a different outcome in mind. Ben Wallace and his teammates stunningly won the series 4-1 to take home the Larry O’Brien Championship Trophy. Now, more than a decade later, Wallace, 44, cherishes those memories and still communicates with his teammates. 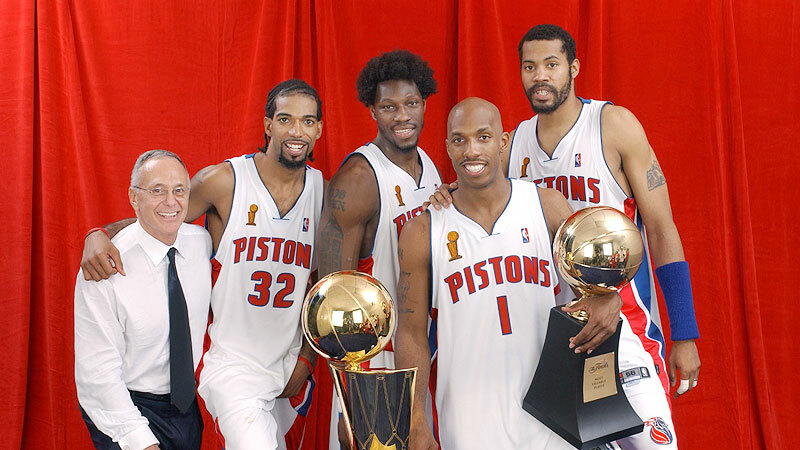 From left to right: Coach Larry Brown, Richard Hamilton, Ben Wallace, Chauncey Billups (holding his Finals MVP Trophy) and Rasheed Wallace of the Detroit Pistons pose for a portrait with the Larry O’Brien Championship Trophy after winning the 2004 NBA championship against the Los Angeles Lakers on June 15, 2004. The four-time NBA All-Star and four-time Defensive Player of the Year (he and Dikembe Mutombo are the only two players in NBA history with four Defensive Player of the Year awards) retired in 2012 after 16 years in the league. Wallace’s transition to life after basketball wasn’t easy. Soon after retiring, he suffered from depression that lasted nearly two years before he could bounce back. He lost weight, going from 250 pounds to 215 pounds. Wallace knew he had to do something better, so he picked up his phone and dialed all the people who told him to call if he ever needed anything or wanted to get back in the game. The first person he called was Dallas Mavericks coach Rick Carlisle. Carlisle asked Wallace if he would have a problem with coming back in on the G League level. Wallace told Carlisle he would be up for the opportunity. He’s happy to have returned to basketball this year as part-owner and chairman of the Grand Rapids Drive NBA G League team. Although his wife and kids are a plane ride away in their newly built home in Richmond, Virginia, Wallace feels great being back in Michigan. If there’s one thing that Wallace does know, it’s he doesn’t want to be done with basketball. After all, it is his first love. There were no Division I scholarship offers for Wallace after high school. The Alabama native, a combo power forward/center, played college basketball at Cuyahoga Community College and Virginia Union, went undrafted in 1996, tried out for Italian team Viola Reggio Calabria — all before getting his chance to play on the big stage. His NBA career included stops at Washington, Orlando, Chicago, Cleveland and, most importantly, Detroit, where his No. 3 jersey hangs in the rafters of Little Caesars Arena. Wallace thought he was prepared for the days after his playing career, but he soon realized that all the money he saved as a player wouldn’t fulfill him in the years that followed. Also, the transition from not being home regularly during the season to being home full time wasn’t easy. “The mistake that I made was thinking that when I was done I could just branch off and find something,” Wallace said. “It’s great now the guys are starting while they are still in the league. I waited until I was done, and then I tried to find something. I was prepared financially but didn’t lay down the groundwork. Now, Wallace holds on to fond memories while also embracing new opportunities. I bought a Chevy Tahoe from Chris Webber. He asked me if I wanted to buy it and he gave me a good deal. He customized the car, and he sold me the car that was easily worth $50,000 for $20,000 in 1996. It was my rookie year and my contract was only $225,000. What advice would you give current players about life after basketball? Start preparing now. Find something that you are passionate about. My pastor told me that I need to learn how to say no and understand the power of the word because it would be the only way to get back to being myself. … One of the hardest things to do is say no to family. I was hooked on Power for a bit. Empire when it first came out. How do you stay healthy and in shape now? I still weight-train. I don’t do competitive basketball anymore, but I still shoot, run and move. I just try to be self-conscious of what I eat and how much I eat now. When I was going through it, I was losing weight. Tell me about Wallace Motorsports and being an ambassador for RC (remote control) racing. Wallace Motorsports is my company where I distribute remote control products. I work with a company in Italy that I import remote control cars from to the United States. My distribution center is in New York. One thing that I was still doing while going through my depression was RC racing. I’d go out to the track and forget everything. That helped. RC racing was dying down, and I’m trying to bring it back. It’s big to the people that know about it. If you show up at one of the big races, you’ll see over 200 racers. We have drivers from all over the world. I’m taking an ambassador role of RC racing. I want to bring more attention to it. It’s something that people of all ages, races, genders can get involved in. How is your relationship with your former teammates? That was the thing that was so unique about that team. We weren’t just teammates, we weren’t just co-workers, we were a family, and that’s how we treated each other. I remember one of Chauncey’s daughters was having a recital at school and we had our whole Pistons team there. That’s just how we did it. We knew every year that the New Year’s party was going to be at Rasheed’s house, the Christmas party was going to be at Chauncey’s house. We just moved as a family, and we still do. I went to China this summer and I took Rasheed with me.